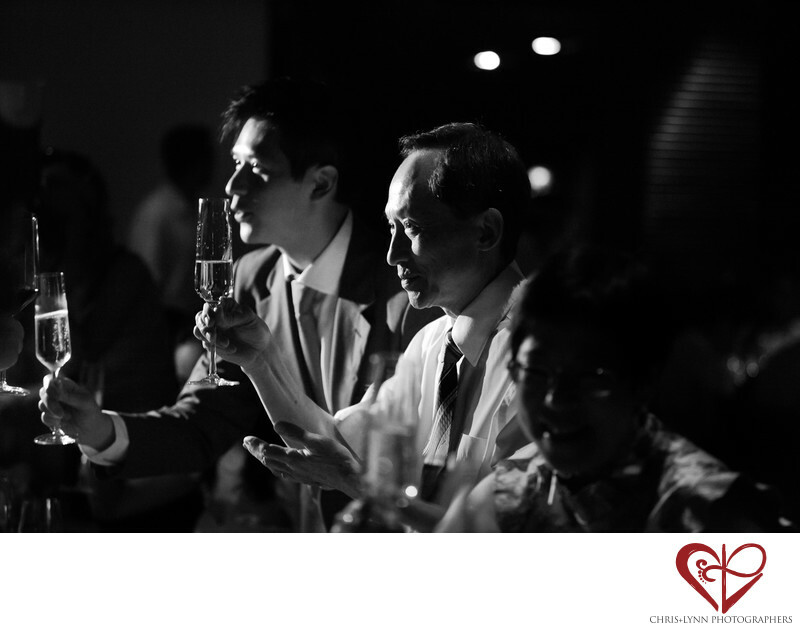 The time-honored tradition of toasting at the wedding dinner is a great opportunity for photography. Everyone is more relaxed after the ceremony is over, and often a memory evoked or expression of love shared during a speech makes everyone emotional. A vestige of the ancient belief that a glass of wine offered to the gods would bring prosperity and protection, today the custom is usually accompanied by heartfelt toasts from the bride and groom's parents or funny speeches from wedding party members that often include embarrassing anecdotes about the couple! At this wedding, the toasts were a serious ritual, a means for the groom and his father to acknowledge and thank every guest for flying so far for this destination wedding in Bali.The dramatic lighting and the father' of the groom's expression and hand motion give this image a solemnity. The Bulgari Bali Resort is known as one of the best wedding venues in Bali, Indonesia. Other top Bali wedding venues include Ayana Resort & Spa, Conrad Bali, Hilton Bali Resort, Anantara Bali Uluwatu’s Dewa Dewi wedding chapel, The Mulia Bali, Banyan Tree Ungasan, The St Regis Bali Resort, The Royal Santrian, Maya Ubud Resort and Spa and the Noah Villa and Chapel. This Canadian couple's Bali destination wedding was featured in the Vancouver wedding magazine Real Weddings, viewable in the Press section of the Chris+Lynn website. Location: Jalan Goa Lempeh, Banjar Dinas Kangin, Uluwatu, Pecatu, Kuta Sel., Kabupaten Badung, Bali 80361, Indonesia Bulgari Resort Bali,. 1/80; f/2.8; ISO 6400; 85.0 mm.